My obsession with lace continues. 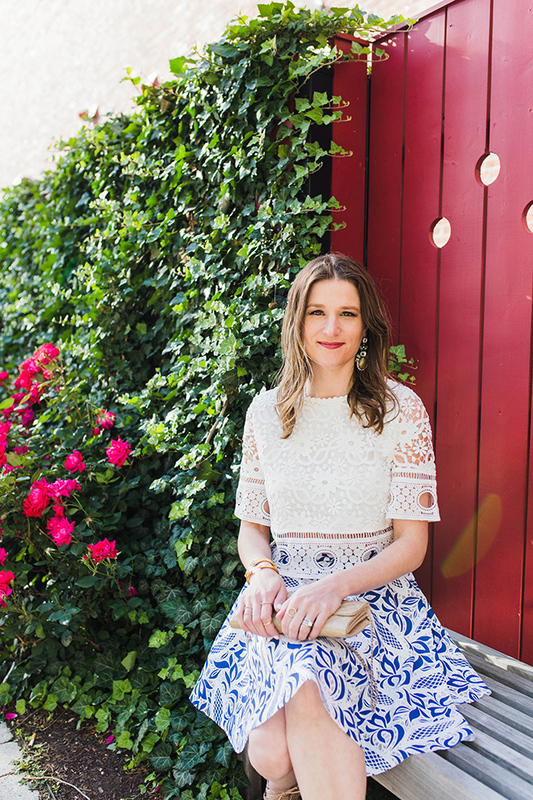 Did you catch Wednesday's post (here) where I shared my favorite summer lace pieces? 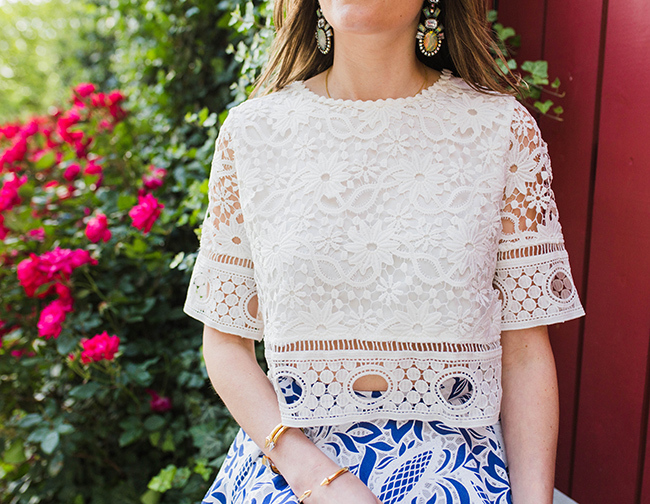 Well, this cropped lace top is easily at the top of my favorites list. Because it is slightly cropped, I wanted to pair it with a bottom that was high waisted. My initial thought was a pair of mom jeans, but then decided that I wanted to go with something a little more flirty and feminine. That's when I remembered I had this lace twirl skirt (last worm here), and thought it made the perfect pairing. I loved how two textures looked mixed together, and finished my outfit with my lace heels for a look that's worthy of a garden party... Or brunch... Or in my case, my niece's preschool graduation. The feature blogger of the week is Betsy from Two Peas in a Blog. I'm loving her black and white look, and the lace up detail on her top! Make sure to head over to her blog and say hello. Rachel, you look FAB! I can't decide which is prettier: the top, the skirt or shoes! That lace top is so pretty, especially with you by all those blooming roses! Such a pretty dress! Love your look! That lace crop top is so pretty! I love it paired with that skirt! You look so chic! Such a pretty top!!! Loving this skirt! Such a pretty lace top! It looks great with the skirt! Love the shoes, too! What a pretty look! That top is amazing! 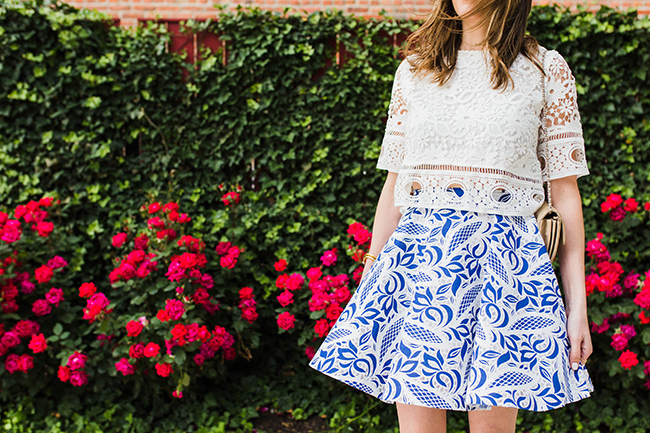 Loving the lace top with the skirt. It has such fun see through detail. Love the detailing of this top, and love that pretty background too! You are gorgeous Rachael! I love that top - the details are so pretty! Hope you have a great weekend lady! Looking lovely Rachael. I am crushing on that top, just stunning on you. You paired these so well! I have a hard time pattern mixing, but you do it effortlessly! Pinning! Love these photos, and how much your outfit pops against the background! Thank you so much Ciera! Isn't the background so pretty? loooove the skirt and the photos and pretty much everything else about this look! In LOVE with this top!! It is so beautiful, and with your skirt, perfect!! Beautiful look Rachael, and gorgeous photos! What a gorgeous outfit! You look absolutely stunning!! I love the textural contrast your outfit is offering!! So lovely. That gorgeous lace top completely transform the skirt into a whole different look form the way you styled it before! Very cool! And those shoes are fabulous! Thanks for hosting the link up. Please do stop by and join my new weekly link up as well! I love white and blue looks in Summer. Its what I wear most of them time. The top is really cute! Those heels are amazing!! 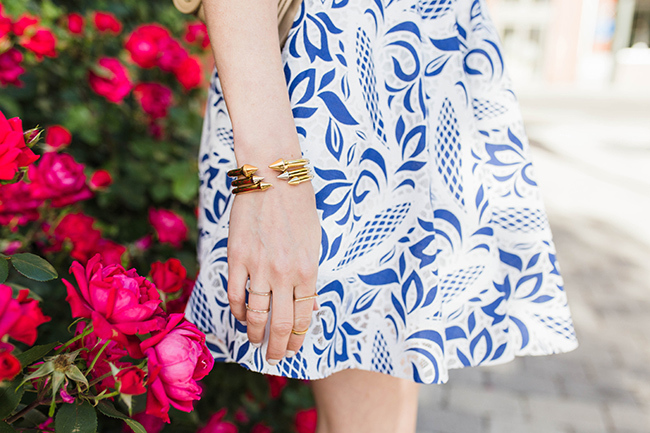 This look is perfect for Summer! Rach, you look so so pretty in this look! So ladylike and super chic! I am loving it. Oh and by the way, the flowers in the backdrop. Swoonworthy! This is such a stunning top!!! This would be the perfect outfit to wear for a summer wedding! I can't get over that top, and the skirt you styled it with is so perfect! Loving this top! It looks gorgeous on you. You are so fabulous! I need this entire outfit!!! You're too sweet, thank you so much Lily! You look so amazing! Love the top and the skirt. This outfit is so chic!